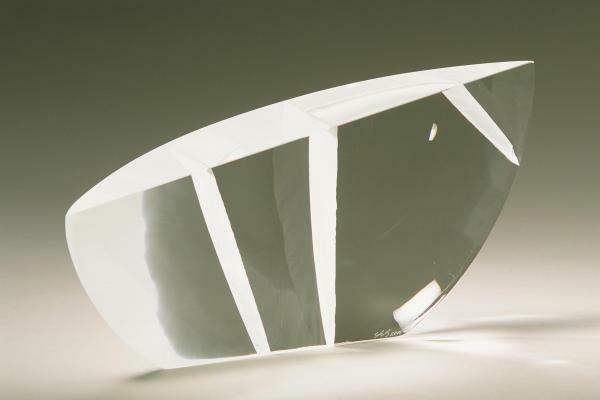 Abstract shaped glasswork, with divisions/lines cut into the piece. Optical glass, cast, cut, polished. A wax model is created. A refractory mould is made around the wax. This mould is fired in a kiln with the glass in it. The glass takes up the shape of the mould. When the glass is taken out of the kiln it is cut using a saw to achieve the divisions/lines you see in the glass. The glass, which is now in several pieces is refired to casting temperature to allow it to remelt into one piece again. The glass is then extensively cold worked using air tools with diamond abrasive pads to bring it to its final polished state. Committed to the living space available in glass, the three dimensions of my work must be self supporting in conveying the moment or idea held still within the glass. This piece is the first in the series Measured Moments and for me was extremely successful on every level; form, content, clarity, complexity and visual strength. It has been a key work in my development in taking my ideas forward, realising an ever clearer expression.